Nikola Tesla “asserted there was a similar power house in Scotland..."
In 1901, Tesla announced that he had begun construction of a ‘Radio City’ on the East Coast of the USA. It was to serve, in the words of one biographer, as the “hub of a worldwide broadcasting system” in which all devices would be connected. At the heart of this proposed city was a restricted section, heavily protected by security personnel and subject to 24 hour surveillance. Here was Tesla’s Wardenclyffe Tower, a curiously large, almost disproportionate electrical station built to his own peculiar specifications and dedicated to the grandiose task of lighting up the world. Literally. Wardenclyffe was to be Tesla’s crowning achievement. The impression we have today is that this near-gothic creation was entirely unique. That this tower alone could power the entire globe was an admittedly stunning, and almost unbelievable claim but Tesla insisted it was true and repeatedly proved true to his word in other projects (look at your phone) so most of us are willing to give him the benefit of the doubt. 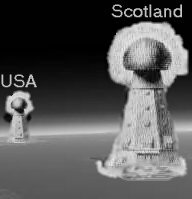 According to a 1902 edition of the Babylon Signal, Nikola Tesla “asserted there was a similar power house in Scotland” but where this enigmatic structure was built, or if it was in fact built at all, remains a mystery. It was well known to the pioneers of the early 20th century that the west coast of Scotland was perfectly structured for the large scale testing of Atlantic radio transmissions. It faced the east coast of the United States and was peppered with numerous isolated spots. An early technician could set up a radio station in any one of the secret sites of the west coast of Scotland and know that his site was safe, secure and within radio reach of America. “When the first plant is inaugurated and it is known that a telegraphic message, almost as secret and non-interferable as thought, can be transmitted to any terrestrial distance, the sound of the human voice with all its intonation and inflections, faithfully and instantly reproduced at any other point of the globe, the energy of a waterfall made available for supplying light, heat or motive power, anywhere - on sea, or land, or high in the air - humanity will be like an ant heap stirred up with a stick. See the Excitement coming..."
"Mr. Nikola Tesla, the world renowned scientist on Tuesday of this week, closed a contract for the immediate building of a wireless telegraph plant and electrical laboratory at Wardenclyffe, situated nine miles east of Port Jefferson, where on the 200 acres recently acquired by Mr. Tesla, he will within thirty days, begin the erection of a plant, which when completed will be the largest of its kind in the world. The first building will be 100 feet square with others to follow. The power plant will be 350-horse power. Mr. Tesla has for several years past maintained an extensive electrical laboratory at Houston Street in New York City, where he has discovered and developed many marvelous features in electrical power and usefulness. The above will draw to Wardenclyffe men in the highest scientific circles from many portions of the globe." Port Jefferson Echo, August 2nd 1901. “Notwithstanding inclement weather and the usual obstacles and difficulties incident to the development of great enterprises, the Tesla improvements at Wardenclyffe have gone steadily forward. The power house, constructed of pressed brick, is 100 feet square and divided into a boiler room, engine and dynamo room, machine shop and laboratory. The boilers, engines, dynamo and other electrical equipment are being placed under the supervision of the Westinghouse Electric Company, where a force of employees from Mr. Tesla’s New York establishment is busy setting the drills, lathes, etc. in the machine room. The power house is completed, the foundations of the great tower put in and the well in connection herewith sunk to the required depth of 120." Port Jefferson Echo, February 1902. "Some of the farmers who come to Wardenclyffe to send their products to the city look at Mr. Tesla’s tower, which is situated directly opposite the railroad station, and shake their heads sadly. They are inclined to take a skeptical view regarding the feasibility of the wireless, world telegraphy idea, but yet Tesla’s transmitting tower as it stands in lonely grandeur and boldly silhouetted against the sky on a wide clearing on the concession is a source of great satisfaction and of some mystification to them all." New York Times, March 1904. "From the time that Tesla secured the large tract of woodland, where the electrical plant is now situated, up to the present date, Mr. Tesla has maintained rigid privacy about his methods and plans. He does not court publicity as to the details of his work and newspapermen who call to see him are not likely to get overloaded with technical information. The visitor who walks into the grounds and approaches either the machine shop or the tower and well is met by an employee, who explains in polite but forceful language, that it is private property and that Mr. Tesla does not care to have visitors at that place. Mr. Tesla claims that it is today possible to communicate between any two points on earth, using the earth as a conductor. From his plant at Wardenclyfe he could run the electric motors and the big printing presses in the Brooklyn Times office. " "Standing like one of the fabled Martian giants, from H. G. Wells’ tale of the “War of the Worlds’, the tall Tesla tower has graced the landscape of this village for a decade and a half of years." Reginald Fessenden constructed a two-way radio transmitter/receiver system across the Atlantic in 1906. He had initially planned to build it in Machrihanish (in a county visible from Ayrshire, sitting roughly at the same latitude as Troon and Prestwick) but the project was abandoned after a storm felled the large antennae and radio shack already built on the site. The entire system was moved to England, where a successful transmission was received before the year was out.